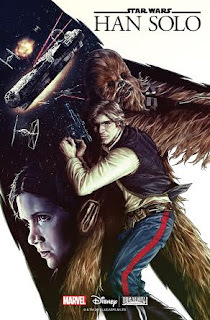 Fangirl Review: STAR WARS: HAN SOLO #1 Punches it Into Hyperspace This June! Everyone’s favorite scoundrel – now starring in his very own series! Today, Marvel is pleased to announce STAR WARS: HAN SOLO #1 – the newest Star Wars™limited series coming to a galaxy far, far away and your local comic shops this June! A-list creators Marjorie Liu and Mark Brooks hop in the cockpit of the Millennium Falcon to bring you a swashbuckling tale of high adventure in deep space!